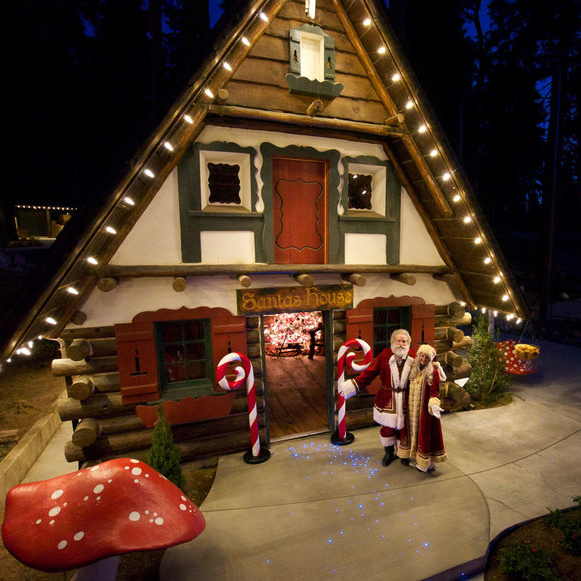 After nearly 20 years, 1950s winter wonderland Santa’s Village, in Skyforest, California, is reopening its doors. The restored attraction, now called Skypark at Santa’s Village, opened last Friday, with restored original features like a giant Christmas tree and a parade along the park’s Candy Cane Lane. Each of the buildings at Santa's Village date back to 1955. There's a restaurant with an electric train that passes over diner's heads, and a charming chapel for visitors to book holiday-themed weddings. The park, which closed down in 1998 due to bankruptcy, was the dreamchild of developer Glen Holland, or “the Walt Disney of the village,” as Davey Marvich, the park’s training and development coordinator, describes him. Holland missed out on much of the grandeur of Christmas, so he made it his goal to give his children the most spectacular Christmas celebrations possible. “He believed in creating a world away from our own,” said Marvich. The park used to operate on a punch-scale system (so children wouldn’t see money being exchanged), but in 2016 has gone high-tech with Radio-Frequency Identification wristbands. The bands let kids go on rides—and also let parents discreetly fill Santa in on what their kids want for Christmas this year. Additional attractions include a Polar Express Train Ride, Santa’s Candy Mine (where you can mine your own rock candy), and Santa’s Workshop and North Pole Post Office, where you can see toys being made, create an ornament, and watch elves pick out letters to Santa from around the world. There's also Arrows Adventure, in which pedal-powered Go Karts take riders to a cave where a singing spider guards Santa’s magical key. The ride is based on Christmas legends the park learned from holiday historians. Nightly carolers and storytellers are all over the park, and every employee has an elf name and appropriate back story to share. And even with the modern touches, the park isn't forgetting its roots with its most iconic piece.